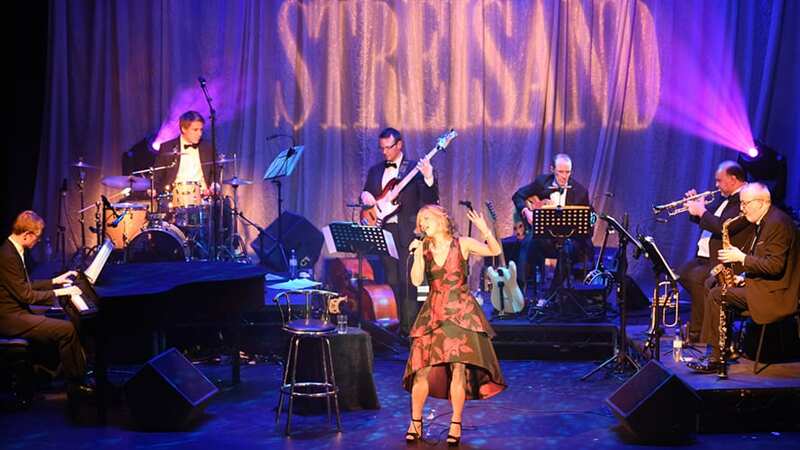 Any show suffixed with the words ‘Sings Streisand’ is always likely to fall between two stools. Is it going to be a singer performing her songs, or a tribute act trying to sound like her? Either way I sensed the performer in question might be on a loser. Liza Pulman (pronounced ‘Lyza’) manages to pull it off, but still lands somewhere between the two. A trained opera singer and member of Fascinating Aida, Liza has an impressive vocal range more than capable of taking on Streisand’s repertoire. The show’s format takes the sensible route of presenting Streisand’s career in chronological order, beginning with Don’t Rain on my Parade from Funny Girl; but then followed by a handful of obscure songs that I wouldn’t have associated with Streisand at all. For example, Miss Marmelstein, a solo number from her first stage musical I can get it for you wholesale; and then Who’s Afraid of the Big Bad Wolf, a song from an early audition. All the songs were recorded and performed by Streisand at some point in her career, but they don’t sit well in what is essentially a cabaret set. However, Liza quickly knocked everyone out with two beautifully performed Harold Arlen songs, Sleeping Bee and Down with Love. Act II very nearly crashes through cabaret into cruise ship territory with On a Clear Day. But it’s soon steered back to credibility with brilliant versions of The Summer of ’42 and (Try to Remember) The Way We Were. Streisand’s Yentl was represented by a powerful rendition of The Way He Makes Me Feel. The show ends where it began with Funny Girl and its unforgettable showstopper People. Liza Pulman radiates charm and beauty with a technically brilliant voice. An excellent six piece band kept the show nicely on the boil. I just wish she would cut loose once in a while as Streisand did; but she seems constricted by the discipline opera has instilled. She has a delicious line in patter between songs: I loved the line about President Trump (‘where’s Lee Harvey Oswald when you need him?’). Amidst the gags is a well-researched history of Streisand’s life and career, which reveals a few things I never knew. There were some omissions I found surprising (Woman in Love and No More Tears especially) but it’s never easy to draw the line with such a wide body of work. Charm is the ability to get people to like you; Liza Pulman does this without breaking into a sweat… and she can sing. Now there’s an embarrassment of riches.